Yesterday, we shared a unicorn themed party, and now we are sharing a unicorn themed nursery! These magical creatures are a natural fit in a child’s space, and Jessica Hughes, of Happily Hughes, added in just the perfect amount to her daughter Henley’s whimsical nursery. Jessica’s blog has been a perfect fit into her life as mom to Hudson, 3, and baby Henley, 6 months. You can find a little bit of everything there, including her experiences as a mom, product reviews, awesome exercise tips—she is an ACE certified personal trainer after all—and more. Thank you, Jessica, for sharing this space with us! With both my kids’ rooms, I wanted to make their rooms relaxing and comforting. When the doctor told me I was having a girl, I started calling her my unicorn as I never expected, in a million years, to have a little girl. The more I shopped the more I enjoyed adding whimsical touches to the decor. I’m all about that glitter life, so I tried to add just enough glitz without going overboard. Yes! The room is long, so I had to rearrange the furniture several times to get the perfect fit. Adding the sugarshack teepee was the last piece of the puzzle! My favorite part of the process was designing it. I was still pregnant and my husband and I had the best time picking out colors and layouts, just dreaming of the day we’d get to place our sweet little girl in her nursery. My most loved aspect of the design is a tie between her little clothing rack and the unicorn from The Land of Nod. How relaxing and inviting it is! The unicorn theme! As soon as I mentioned it so many ladies commented on how original that was. 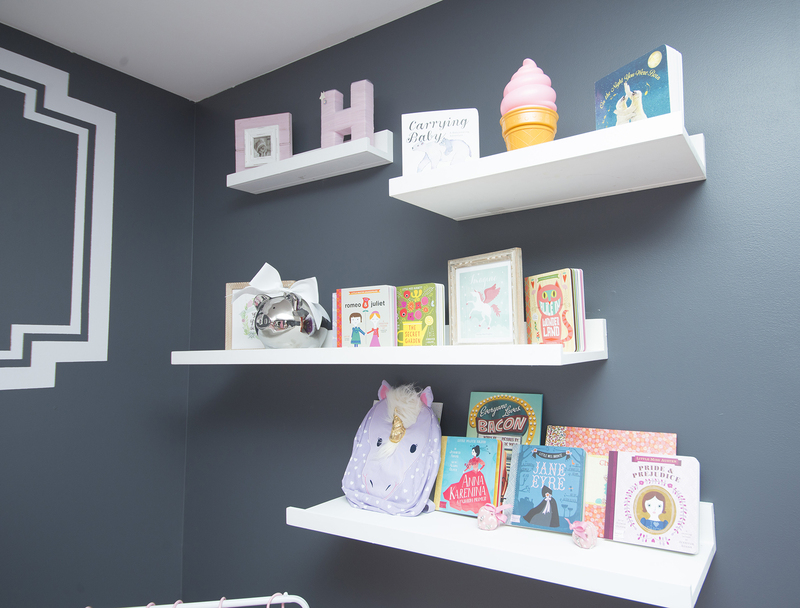 What were your nursery must-haves when you started? A comfy rocker and a fun night light. How long it would take me to finish it! Henley’s almost six months, and I’m just now finishing! Take your time, and enjoy the process!